In the past few weeks we sized up the nation’s top defensive lines, linebackers and secondaries. Time to switch to the other of the ball beginning with the nation’s Top 10 offensive lines. Deshaun Watson gets most of the headlines, but there’s lot of talent all over this team. The most underrated group in 2015 was the Tigers O-line, which had been overhauled yet still ranked No. 19 in fewest sacks allowed (and most of the teams that allowed fewer throw it much less than Clemson) and were No. 21 in rushing. Line coach Robbie Caldwell is probably best remembered for charming everyone in his short run at Vandy’s head coach, but this guy is a heckuva teacher. Freshman LT Mitch Hyatt was a revelation. The Tigers’ first true freshman to start the opener on the O-line in 35 years, he was often at his best against the toughest teams. He’s also worked hard to get stronger and has bulked up 15 pounds from the 285 he played at in 2015. Center Jay Guillermo had a terrific season as well, making the coaches’ second-team All-ACC squad. Junior Tyrone Crowder, at 6-2, 330, is a beast in the run game. The ACC coaches picked him for third-team all-league last fall. One of the new starters will be RT Jake Fruhmorgen, a second-year sophomore, who started one game in 2015. He, too, has added some good size and is up to 302 pounds, from 282 last fall. The other new starter is expected to be 320-pound sophomore guard Taylor Hearn. Highly regarded Justin Falcinelli will push him for playing time. Ethan Pocic is a tall center at 6-6, 302 pounds. He’s also an excellent one. He’s strong, athletic and explosive. Better still, he’s a gymrat. Left guard William Clapp is one of the best linemen in the SEC. He’s just very solid. Right guard Josh Boutte may be the most physical O-lineman the Tigers have, according to Les Miles. He’s a heavy-handed player and is a beast as a pulling guard. Maea Teuhema is a really athletic, fluid tackle at 6-4, 325-pound player who also can play guard and Toby Weathersby is physical sophomore from Texas battling for a spot at tackle along with Chidi Okeke, a nimble 6-6, 310-pound redshirt freshman from Nigeria. Also, remember the name Donovaughan Campbell, a 6-5, 350-pound freshman road-grader at guard that the staff is excited about. The Tide had the nation’s best O-line last season, but did lose some good players off that 2015 squad. Most notably, center Ryan Kelly, the best guy and the leader of the group. 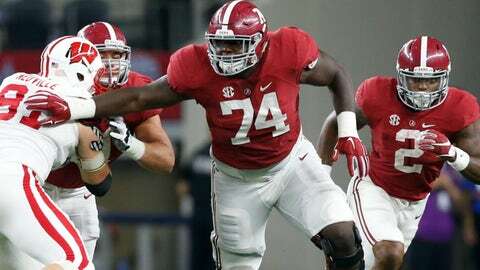 Cam Robinson returns at left tackle and he’s a dominant force, especially in the run game. Sophomore guard/center Ross Pierschbacher is heady and physical and a guy the staff is really high on — as are guard Brandon Kennedy and Lester Cotton. Massive Alphonse Taylor started all last season at guard, but his recent DUI has put his status in jeopardy since he’s been suspended indefinitely. He had a bad offseason and has battled weight issues and was actually demoted in the spring. Freshman OT Jonah Williams may be the most talented player of all of ’em (with the possible exception of Robinson). Saban and his staff love the 6-5, 290-pound California import. "He’s a very bright guy and very athletic. He has really good lower-body explosion. Good feet," Saban said, adding that Williams just needs to get a little bigger and stronger. A group that used to be pretty shaky matured nicely under Tim Drevno and is projected to start three seniors this fall, but they will have to replace rugged center Graham Glasgow. Former left tackle Mason Cole is a stud and seems capable of handling the role. He’s stout, has very quick hands and very sharp. Promising sophomore Grant Newsome, a 6-7, 300-pounder, is ready for left tackle with his improved strength from last year. Both guards are senior returning starters — Ben Braden and Kyle Kalis — and they’re good. Erik Magnuson, a senior, is coming off a strong season at right tackle. One other prediction: Massive Michael Onwenu is a true freshman who will become a dominant run blocker in time. Dana Holgorsen has added a second O-line coach, bringing on Joe Wickline, who he had a great working relationship with Oklahoma State, to coach the tackles and tight ends coaches, and that should be a big plus. The interior of this line is already terrific. Tyler Orlosky (29 career starts) at center is a heckuva starting point for the Mountaineers. He’s excellent as both a run and pass blocker and heady. Last year, WVU ranked No. 17 in rushing offense and it was behind a line that returns four starters. Michigan transfer Kyle Bosch played well at RG. Adam Pankey (25 starts) will handle the other guard slot. Sophomore Yodny Cajuste, a former prep basketball standout, is an athletic OT with long arms and terrific feet. The staff thinks he has a bright future and Marcell Lazard got some seasoning last year at right tackle, but that is probably the biggest question mark here. Keep an eye on 6-7 redshirt freshman Colton McKivitz, who is intelligent, has good length and is one the coaches are excited about. Fifth-year senior Tony Matteo is an experienced back-up. Holgorsen said it’s not even close how much better this line is already compared to the 2015 OL. "It’s the best line I’ve ever been around," he said. Rick Trickett’s been one of the top O-line coaches in football for years, and he’s developed another outstanding crew. This was a very young group in 2015, but it came together pretty well to help Dalvin Cook make a run at the Heisman. The group does have to improve at protecting the passer, and I expect it will take a big step forward. Last season, they allowed 26 sacks and were No. 59 nationally in fewest sacks given up per game. All five starters return, led by OT Roderick Johnson, the ACC’s top offensive lineman last year. Kareem Are and Wilson Bell have proven to be solid guards with big David Robbins pushing them for playing time. In the middle, FSU has Alec Eberle, Corey Martinez and big Cole Minshew. Chad Mavety offers versatility and is a good run blocker while young Abdul Bello from Nigeria has a lot of promise. The headliner here is mammoth 6-9 OT Zach Banner, who told me last week he’s shed 45 pounds from the 387 he played at in 2015. Banner, according to rival coaches, improved dramatically last season as did the rest of this group, but there are still some questions about how well he can block in space. This unit really missed superb center Max Tuerk last fall, when he got injured, but that did afford some other younger linemen a chance to get some seasoning. Center Toa Lobendahn is a guy the staff really likes and guard Viane Talamaivao is another name to know. 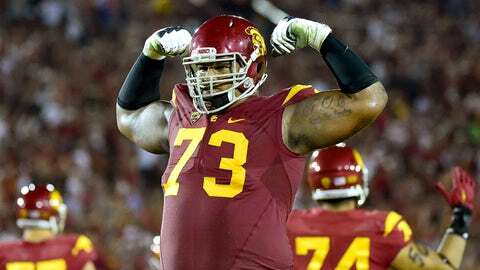 Former five-star recruit Damien Mama, who was up near 400 pounds, has gotten into better shape and can be a mauler. Left tackle Chad Wheeler’s had an up-and down career, but does have some good ability. The Irish lost one superb tackle in Ronnie Stanley, but still have towering Mike McGlinchey coming back, and he had a terrific debut season as a starter working at right tackle. He’s already proven to be an outstanding run blocker as had guard Quenton Nelson, the only other returning full-time starter, a true road-grader at 6-5, 330. Alex Bars, who impressed the ND staff early in his career, missed much of last season with a broken ankle. RG Hunter Bivin will try to assert himself as will new center Sam Mustipher. 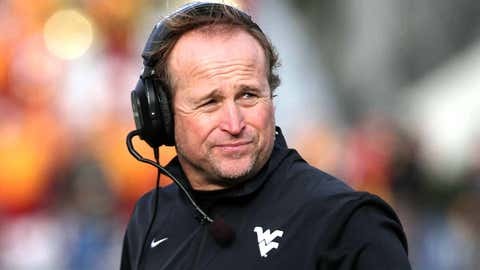 Dana Holgorsen has added another line coach. Not shockingly, Kirk Ferentz should have another really good O-line with the Hawkeyes. He has three starters back with a couple of former walk-ons who have blossomed into good Big Ten players in senior left tackle Cole Colston and Boone Myers the left guard. Junior Sean Welsh can play guard or center, but is expected to anchor the middle and should do so very well. He was an honorable mention All-Big Ten pick by the league’s coaches in 2015. Right tackle Ike Boettger (another one-time high school QB-turned-starting Hawkeye O-lineman like former star Brandon Scherff) has developed into being a solid player and strong run blocker after arriving as a tight end. Sophomore guard James Daniels should be a real force for the Hawkeyes in his career although he is coming off a knee injury. Huge LT Orlando Brown, at 6-8, 340, is a first-team All-Big 12 preseason pick. The other tackle Dru Samia is heady and very versatile player while Jonathan Alvarez should prove to be one of the Big 12’s better centers. Cody Ford and Ben Powers, along with Ashton Julious, are in the mix for the guard spots, along with Quinn Mittermeier. Promising Bobby Allen, a redshirt freshman, is pushing for playing time at tackle. Center Logan Roberson also impressed this spring as an early enrollee. Zach Banner has lost 40-plus pounds. In 2014, this unit paved the way for the Badgers to average 6.91 yards per carry, the fourth-best rushing average in FBS history. It dropped all the way down to 3.82 last year (No. 113 nationally). That decline certainly was escalated not just with the departure of star RB Melvin Gordon but also with the season-ending knee injury of starting center Dan Voltz, who went down in Week Eight. The Badgers averaged just 2.7 yards per carry in November with him sidelined. Voltz, one of the country’s top linemen, is back and shifts to left guard. He was a key part in that while sophomore Michael Dieter will be the center. Former tackle Beau Benzschwel will be the right guard. Transfer Ryan Ramcyzk, a 6-6, 305-pounder whom teammates have called a freak athlete and drew raves from former pass-rushing star Joe Schobert for his work on scout team last fall, is expected to be the left tackle with sophomore Jacob Maxwell at right tackle. Just Missed the Cut: Pitt, Auburn, UNC, Appalachian State, WKU, Bowling Green, BYU.